They fly in the most challenging conditions, but are the safest form of helicopter operations. Insiders say there’s no secret formula to their success, just hard and consistent work in managing the business of safety. Every day about 6000 people live and work in harsh little steel worlds, dotted around the coast of Australia, far from land. They are workers on the oil and gas installations that stretch from Timor Sea to Bass Strait. They depend utterly on helicopters for transport and medical evacuation. Offshore helicopters are in the business of flying passengers and some supplies to platforms up to 250 nm from land. At the end of that flight the helicopter lands on a helideck that may be heaving vertically, rolling from side to side or pitching. And they are required to do this at night and in winds and weather up to sea state 5. The offshore business is booming in Australia, where the oil and gas fly-in-fly-out (FIFO) workforce grew by 96 per cent between 2006 and 2013. Gavin Guyan, general manager of safety and integrity with the National Offshore Petroleum Safety and Environmental Management Authority (NOPSEMA), takes a sober view of the risks of offshore aviation. From late 2015 Bristow helicopters will support offshore facilities in the Great Australian Bight, when BP, Santos and Chevron begin operations. Bristow’s chief pilot, Marc Newmann, says the company has had previous experience in the Bight. Bristow will operate from a base in Ceduna, but will also build a transit point closer to the oil platforms. ‘It will allow an extra 20 miles range, which doesn’t sound much but that equates to 40 nm of fuel or about the weight of two passengers,’ says Newmann. The Bight will bring distinct operational challenges. It lies in the high winds of the roaring forties latitudes where for 10 days a year, significant wave heights exceed six metres, which is beyond the height that the latest large offshore helicopters such as the Airbus EC225 are certified to stay upright in after a water landing. Like large-scale airline transport, offshore helicopter aviation is an international business. And just as the phones of airline safety managers around the world start ringing when an airliner crashes in San Francisco, or Ukraine, so too do the flight tracking smartphones of offshore aviation safety managers. That’s why offshore helicopter operators from the Gulf of Mexico to the Black Sea are drawing lessons from helicopter operators in the North Sea between the United Kingdom and Europe. 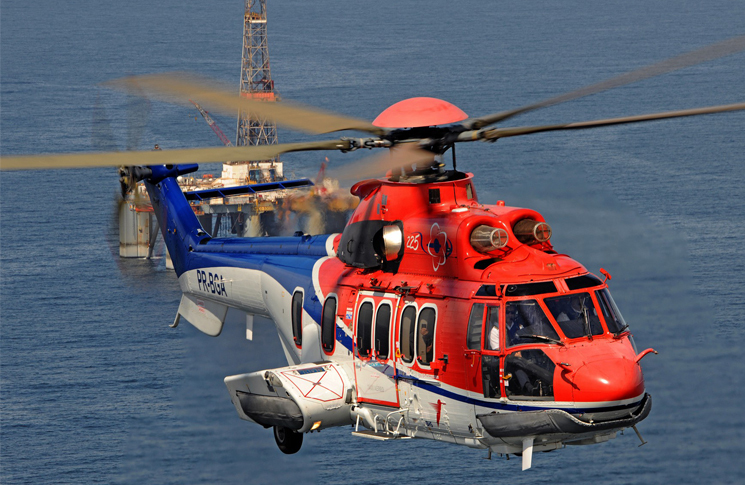 Fatal crashes in 2009 and 2013 led to an inquiry review into helicopter safety in the United Kingdom (UK) sector of the North Sea oilfields. The review, conducted by the UK and Norwegian civil aviation authorities and the European Aviation Safety Agency (EASA) put forward 32 measures, including a ban on flights during the most severe weather conditions and a size limit for passengers who are too large to escape from a downed helicopter through its emergency push-out windows. Another proposed change is to upgrade the type of breathing apparatus passengers use in underwater emergency evacuation to a scuba-type compressed air system, rather than the current re-breather system. In many organisations change management is a vague, consultant-speak concept that relates to persuading affected people of the merits of change. In the helicopter industry change management is about making sure no one is harmed as a consequence of change. Risk assessment is at the heart of change management, Blake says. ‘What new risks are we opening up? Have we got the right level of parts, have we got the right trained pilots, have we got the right qualified engineers? ‘For example, because our colleagues elsewhere have flown the S-92 we go back and look at what incidents happened when they introduced the S-92. We don’t want to repeat their mistakes. What are we going to do about working at height round the S-92 because it’s a very big helicopter and we can’t use the same scaffolds and work stands as for the EC 225? Bristow engineering manager, Neil Seabrook, says international information exchange is also vital. In the oil and gas industry learning from mistakes is not an option. Disasters such as the Piper Alpha fire in 1988 and the BP Deepwater Horizon spill of 2009 are too expensive—in both lives and money. The accident moved industry in the direction of ‘assessing the risk and having controls in place, rather than having prescriptive nuts-and-bolts standards,’ Guyan says. Offshore aviation has taken this cue from its clients, and was an early adopter of the oil and gas industry‘s practice of using safety management systems. Hurley says the foundation of safety management is ensuring you know how safe your organisation is, even at the cost of hearing bad news. Blake describes the four fundamentals of safety as: core values, management commitment, communication and reporting. ‘One, your first core value has to be safety,’ he says. ‘So we have safety as our core value. It prevails over everything else we do. ‘Secondly, it’s not good enough to have safety written down. The management team have to be focused on it every day. We’ve got to run a business and make money, but safety has to be the trump card. It has to trump everything. ‘Thirdly, just because we think that way doesn’t mean our staff will understand our commitment (to safety). So we have to ensure that staff are aware and understand our safety priority. Whether you ask us or the staff about safety the answer has to be the same. The danger is that we think one thing and staff on the ground think another. Audit is common theme in speaking with offshore operators. They have become used to being under the spotlight. ‘In the oil and gas industry we get heavily audited. We’ve had 33 audits scheduled this year for one base,’ says Hurley. Bristow’s managing pilot, Marc Newmann, says audits are both internal and external. SMS involves the transfer of some of the responsibilities for aviation safety issues from the regulator to the individual organization. This is a role shift in which the regulator oversees the effectiveness of the safety management system, but withdraws from day-to-day involvement in the organizations it regulates. For offshore helicopter operators audit is a second-tier in additional to commercial ties, between them and their customers. Under SMS, despite a regulator being less involved in the day-to-day minutiae of an operation, there is, paradoxically, a greater need for technical expertise.